Last year Hammock Bay celebrated its first Tree Lighting Ceremony and if you were there, you know it was a huge success! Being the first year, we didn’t have any idea how many people would show up to watch the 50 foot tall tree come to life on that brisk December night, but we were pleasantly surprised. The hot chocolate was gone before Jay Odom, the developer of Hammock Bay, even began his welcome speech! It was such a hit last year that of course the event had to be bigger and better this year! 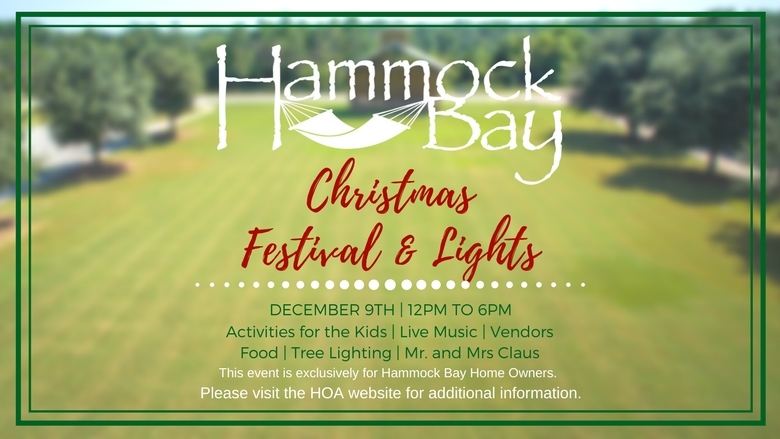 Hammock Bay Home Owners, mark your calendars on December 9th for Hammock Bay’s Christmas Festival & Lights. There will be plenty to keep the entire family entertained all afternoon and evening. Get some holiday shopping done while listening to live music, enjoy delicious food and crafts with the kids, and don’t forget to meet Mr. and Mrs. Claus! We hope to see you there!